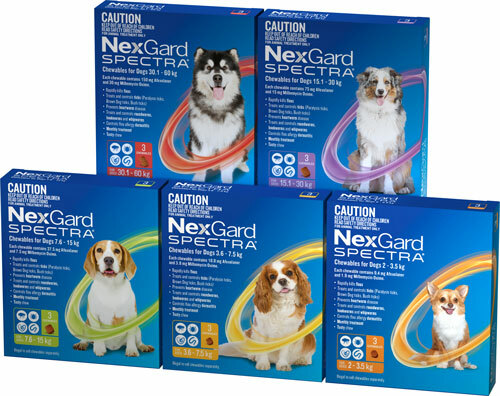 Nexgard Spectra: Fast Action and Effective! Nexgard Spectra is a new once a month, chewable tablet for the effective control of fleas, ticks, heartworm and intestinal worms for dogs and puppies. It combines two active ingredients (Afoxolaner and Milbemycin Oxime) for protection against the most common internal and external parasites of dogs. It is easy to administer and has a tasty beef-flavoured chew that your dog will love!